Early May planting in Wisconsin has been documented to increase yield due to increased light interception (Gaspar and Conley, 2015). Earlier planting dates are able to increase light interception in two ways, which are both demonstrated in Figure 1. First, the reproductive growth period between R1-R6 occurs during longer days with the May 1st (Green line) compared to June 1st (Orange line) planting date. Secondly, the time spent in the R1-R6 growth stages is increased with the earlier planting date. 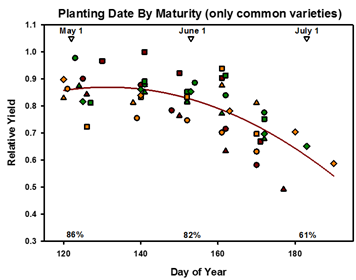 As Figure one shows, the May 1st planting date spent ~60 days from R1-R6 compared ~45 days for the June 1st planting date. Therefore, early plated soybeans experience both longer duration in reproductive growth (more days) and reproductive growth during the longest days of the summer. Figure 1. Blue lines represent day length at various latitudes. Most WI soybeans are grown between 43 and 45 degrees latitude. The vertical lines represent the time spent from R1 through R6 for May 1st (Green Lines) and June 1st (Orange Lines) planting dates. WI soybeans are mainly grown between 43 and 45 degrees latitude. Yet, in some instances (weather or logistical problems) planting can be delayed or replanting may be needed. Therefore, investigating the effect of different MG’s at multiple planting dates across the state would be useful. Thus, DuPont Pioneer and the Wisconsin Soybean Marketing Board funded a 3-year study to examine proper MG selection at 5 different planting dates across the state to maximize yield. So let’s look at the 2014-2016 data. Trials were conducted at Arlington, Hancock, and Spooner, WI. The five planting dates at each location were planting roughly on: (1) May 1th, (2) May 20th, (3) June 1st, (4) June 10th, and (5) June 20th. Planting after June 20th is generally not recommended in WI. Two varieties within each realistic MG from a 2.5 all the way down to a 00.5 were tested depending upon the location and planting date and are displayed in Table 1. We will start with the easy and redundant part, get your soybeans in the ground ASAP to maximize yield. This is very evident again in this trial as shown in Figure 2 and 3. If the soil is fit, soil temps are near 50 ˚F, and the forecast is favorable….. get that soybean planter rolling! As you would expect we found some very interesting synergies between early planting and longer MG’s. Figure 2 contains MG 1.5 soybeans which at the May 1st planting date only achieved ~85% of max yield. Figure 3 contains the longest maturing soybean varieties (>1.5) for each location where soybeans reached 99% of max yield, with May 1st planting. Furthermore, as planting is delayed, the earlier MG bean’s (Figure 2) do not show a quick and dramatic yield decline compared to the later maturing beans (Figure 3). Therefore, those that may have not experienced yield loss from delayed planting are likely planting varieties from a MG too short for their respective area. Clear yield synergies are demonstrated in Figure 2 and 3 from planting early and using a longer MG soybean variety. Both management practices add no additional cost, meaning any yield increase is direct profit. Figure 2. Yield of planting date from May 1st (120) into June of 1.5MG soybean varieties. Figure 3. Yield of planting date from May 1st (120) into June for longest maturing soybean varieties at each location. Table 2 agrees with the conclusion from Figures 2 and 3, that early planting and longer maturity groups maximize yield. 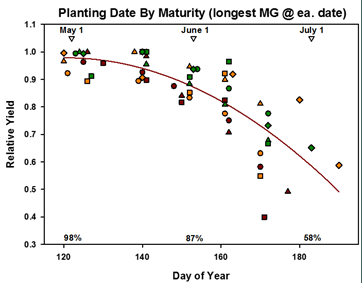 However, due to no significant MG effect at the Spooner location, the synergy of early planting and longer MG’s, may not be as consistent in Northern WI where the growing season is condensed. 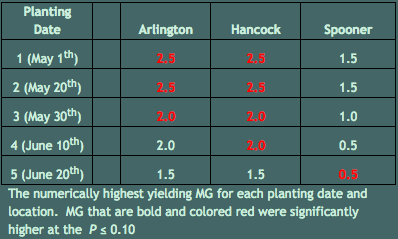 Planting date 5 at Arlington and Hancock was not significant for MG effects, but the longest MG planted there still yielded the highest numerically. This was also the case at Spooner, but the 0.5 MG significantly out yielded the 0.0 and ultra-early 00.5 MG varieties. These results suggest planting a portion of your acres to slightly longer MG than normal within May can result in greater yields with no additional dollars spent. In addition, when planting is delayed into June, switching to a variety much more than 0.5 MG earlier than a full season variety (2.5 MG) may limit yield potential. However, if planting is delayed until mid to late June or more likely replanting is needed, a variety that is at least a full MG earlier should be considered to avoid fall frost damage. In conclusion, early planting is critical for higher yields through increased light interception, and can be further maximized by planting longer MG’s. However, variety selection heavily based upon the MG is not the “silver bullet” for increasing yields. Yet, it does provide a strong “potential” for higher yields with no additional dollars spent, especially in early planting situations. Therefore, growers should give consideration to MG when selecting varieties, but past local and regional performance, disease package, scn-resistance, etc. should also strongly be considered. Gaspar, A.P. and S.P. Conley. 2015. 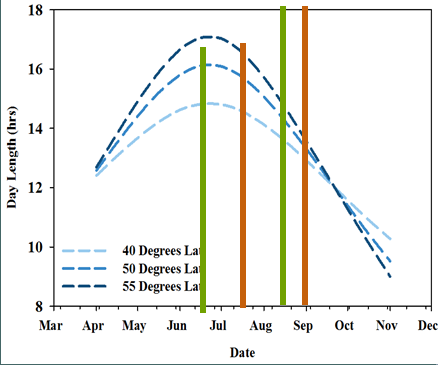 Responses of canopy reflectance, light interception, and soybean seed yield to replanting suboptimal stands. Crop Sci. 55:377-385.